Ansley Designs: Be Still my ❤ - Valentine's Day Crafts! Be Still my ❤ - Valentine's Day Crafts! Valentine's Day?? But it's not even February! That's what I normally think...but as it draws closer to Valentine's Day I start looking for projects, and sometimes they are so involved that I do not have enough time to complete them and still enjoy them for long enough before the holiday. 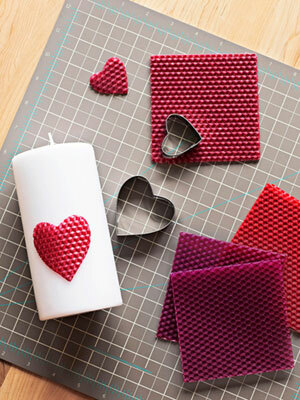 So in the spirit of preparedness, here are some awesome Valentine's Day projects! These seem very simple to make. I picked up this idea from Good Housekeeping. These could be very affordable. Just pick up some pillar candles from the Dollar General (as long as you don't mind that they are unscented!) and some beeswax from your craft store. Use heart shaped cookie cutters on the beeswax, and there you have it! Just stick the shape onto the candle, and if necessary, use a hair dryer to warm the wax so it will stick to the candle. I ❤❤❤ this idea, and if my husband wasn't deployed I would definitely be making these!!! I think my favorite is the "Husband Happiness Enhancer!" Make the Best of Everything has a simple tutorial to make these labels, and for you non-crafty ladies, she even gives the option to purchase them through her ETSY shop. As an alternative, you could adhere your his favorite label to a beer koozie for the gift that keeps on giving! For example, my favorite - "Husband Happiness Enhancer!" is not strictly Valentine's Dayish, so this could be something he uses year round! How cute! A little felt can go a long way! 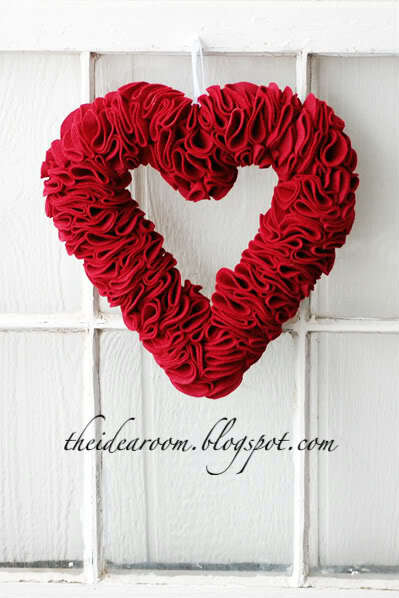 Cut felt into the shape of a ❤ and use sticky tack to adhere it, temporarily, to any picture frame. Wouldn't that be sweet on one of your wedding photos? The previous idea can be used to make a book mark. Create one larger felt ❤, and a smaller one that mirrors the first - coordinating colors would look nice. Be sure that the lower portions of each ❤ are the same size. Hand stitch the two "V" portions of the smaller and larger ❤'s together, ensuring the "V" parts of each ❤ line up. Simply slip the bottom corner of your book pages into the pocket within the ❤'s. What a lovely bookmark! Use Valentine's themed candy to fill a jar or vase. Top it off with flowers or a candle for an easy dash of Valentine's decor. Bonus: you can eat it after the holiday! 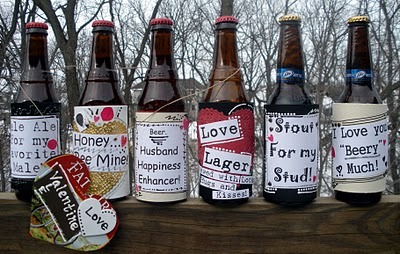 What is your favorite craft or activity for Valentine's day? Do you prefer to give something hand-crafted or just purchase something nice?